In search of the first microorganism Antoni van Leeuwenhoek: described. In search of the first microorganism which Antoni van Leeuwenhoek described. Adobe Acrobat® version. One page Summary. "About two hours distant from this Town there lies an inland lake, called the Berkelse Mere, whose bottom in many places is very marshy, or boggy. Its water is in winter very clear, but at the beginning or in the middle of summer it becomes whitish, and there are then little green clouds floating through it ; which, according to the saying of the country folk dwelling thereabout, is caused by the dew, which happens to fall at that time, and which they call honey-dew. This water is abounding in fish, which is very good and savoury. Passing just lately over this lake, at a time when the wind blew pretty hard, and seeing the water as above described, I took up a little of it in a glass phial ; and examining this water next day, I found floating therein divers earthy particles, and some green streaks, spirally wound serpent-wise, and orderly arranged, after the manner of the copper or tin worms, which distillers use to cool their liquors as they distil over. The whole circumference of each of these streaks was about the thickness of a hair of one's head. Other particles had but the beginning of the foresaid streak ; but all consisted of very small green globules joined together: and there were very many small green globules as well. Among these there were, besides, very many little animalcules, whereof some were roundish, while others, a bit bigger, consisted of an oval. On these last I saw two little legs near the head, and two little fins at the hindmost end of the body. Others were somewhat longer than an oval, and these were very slow a-moving, and few in number. These animalcules had divers colours, some being whitish and transparent ; others with green and very glittering little scales ; others again were green in the middle, and before and behind white ; others yet were ashen grey. And the motion of most of these animalcules in the water was so swift, and so various, upwards, downwards, and round about, that 'twas wonderful to see : and I judge that some of these little creatures were above a thousand times smaller than the smallest ones I have ever yet seen, upon the rind of cheese, in wheaten flour, mould, and the like." 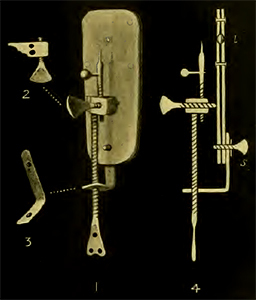 Typical microscope design of Van Leeuwenhoek from Dobell's biography. There has always been a lot of speculation about the true nature of the organisms he described in this letter. Van Leeuwenhoek was a layman and it was long before Linnaeus provided us with a systematic way of describing living organisms. Almost everything Van Leeuwenhoek observed through his simple single lens microscope had never been seen before. Van Leeuwenhoek did not give the organisms names, he simply described their appearance, as detailed as he could. He was one of the best observers of his time. In any case literally because he was the only one who could make a microscope with a magnification of up to several hundred times and with a very high resolving power. 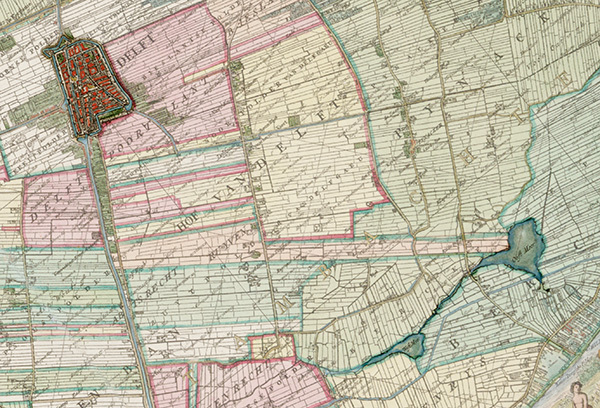 The Berkelse Meres were situated south east of Delft, where Van Leeuwenhoek lived. Spirogyra photographed in darkfield illumination. Image width: approximately 0,9 mm. One of the most influential scientists who studied the work of Van Leeuwenhoek was Clifford Dobell (1886 -1949). He was a protozoologist who studied intestinal amoebae but also published on algae. His classic biography about Van Leeuwenhoek from 1932 Antony van Leeuwenhoek and his little Animals from which the above translation was sourced was very popular and most of the names put to the descriptions of Van Leeuwenhoek can be credited to Dobell. He thought the spirally arranged green 'streaks' Van Leeuwenhoek described were Spirogyra, a filamentous alga that has coiled chloroplasts. Ever since, this is regarded as the organism Van Leeuwenhoek described. Dobell comments (Footnote 2, p. 110): "The common green alga Spirogyra: the earliest recorded observations on this organism. The size of the filament negatives the suggestion that L. could have been referring to Arthrospira or Spirulina, (these are filamentous cyanobacteria)." He furthermore gives suggestions for the other organisms Van Leeuwenhoek mentioned: ciliates, rotifers and Euglena. We can be pretty sure he observed at least one of these groups in the sample, but the description of these organisms is not as detailed as the first one. The present article is about that first observation, the most important one, the first observation of a living aquatic microorganism. Dobell dismisses Arthrospira and Spirulina because of their size. I agree. But could there be other candidates? It is now 2016 and Frans and I have discussed this subject over the years. I have studied Van Leeuwenhoek for my work for a museum about microbes, continuously finding new clues. An extra reason why I am so interested is the fact that I grew up near the location and live near the former Berkelse Meer. Frans currently is very busy with his monograph of the desmid genus Cosmarium and encouraged me to write the article. But Frans is reading over my shoulder so don't forget that he started all this. Let's start to sum up the reasons why we think Spirogyra is an unlikely candidate. And perhaps it is a good moment to refer to the motto of the Royal Society; Nullius in verba, which can be translated as 'take nobody's word for it'. 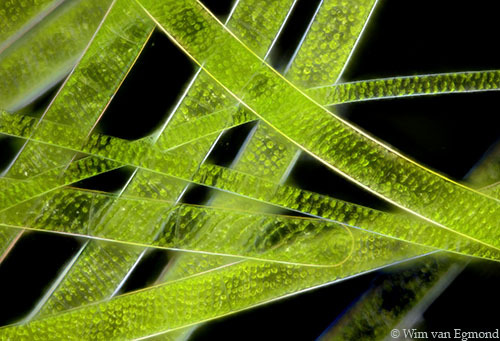 Spirogyra is common in shallow ponds and ditches. A large lake as the Berkelse Meer was (1.5 kilometer wide) is not the usual habitat. Although it inhabits lake edges it is not planktonic. Spirogyra does form floating masses but in early summer, and then their color is not whitish green but yellow or brown green. Spirogyra blooms consist of very long filaments or strands, not microscopic streaks. Being such a keen observer, Van Leeuwenhoek was always very accurate in his observations. He would certainly have described Spirogyra as long strands. If you find Spirogyra you can take it out of the water with your hands as scum, and it feels slippery. Van Leeuwenhoek used capillary tubes at the time for studying liquids e.g. in his earlier letter dated July 6th 1674. If he did it would be impossible to put Spirogyra in such a tube. Spirogyra bloom, forming floating algal beds, photographed in June. There is enough reason for doubting it was Spirogyra. It is interesting to see that for such a long time everybody copied Dobell's suggestion, although it is understandable. What else could it have been? Before we search for other candidates, let's look again at the description. "I found floating therein divers earthy particles, and some green streaks, spirally wound serpent-wise, and orderly arranged, after the manner of the copper or tin worms, which distillers use to cool their liquors as they distil over. The whole circumference of each of these streaks was about the thickness of a hair of one's head. Other particles had but the beginning of the foresaid streak; but all consisted of very small green globules joined together : and there were very many small green globules as well." "bevonde ick daer in te drijven, verscheijde aertsche deeltgens, ende eenige groene ranckjens, in geschickte ordre slanghs gewijse omgekrult, op gelijcke manier, als de copere off tinne slangen sijn, die de distelatuers gebruijcken, omme haer over gehaelde wateren te verkoelen, ende de gantsche circumferentie, van jder van dese ranckjens, hadt ontrent de dickte van een haer van ons hooft; andere deeltgens hadden maer een begin, van het boven verhaelde ranckje, alle bestaende uijt seer kleijne groene same gevoeghde clootgens, als mede seer veel kleijne groene clootgens,"
Van Leeuwenhoek only wrote in Dutch. He did not know any other language and his Dutch is translated by others. That is why I think we should look at the original Dutch text and try to read it as carefully as possible. The actual Dutch word Van Leeuwenhoek used was 'ranckje' (plural ranckjens). While writing this article I noticed that the English translation of the word 'ranckjes' (both in the Collected Letter's and Dobell's), into 'streaks' is not accurate. The word streak is a bit misleading because it suggests an elongated shape. In my opinion a correct translation would be small tendril. And I am sure he used the Dutch equivalent because a tendril is often coiled. The Dutch text is even clearer on the coils than the translation. It can be translated various ways. Here's what I would make of it: Several earthy particles and some green tendrils that are bent snake-wise to orderly arranged curls, like the copper or tin tubes distillers use to cool their transferred water. Movements and Habits of Climbing Plants - 1854. Next: why would Van Leeuwenhoek mention 'the whole circumference' for the thickness of Spirogyra? If you look at Spirogyra it is not necessary to add 'the whole circumference'. It should be enough to describe it as 'long strands the thickness of a human hair'. He only had a reason to mention 'the whole circumference' when it is not obvious whether that thickness refers to the coil or what the coil is made of. Could it be that he wrote 'the whole circumference' because the organism he described actually was a coil and not a tube with coils inside such as Spirogyra? "Other particles had but the beginning of the foresaid streak ; but all consisted of very small green globules joined together : and there were very many small green globules as well." 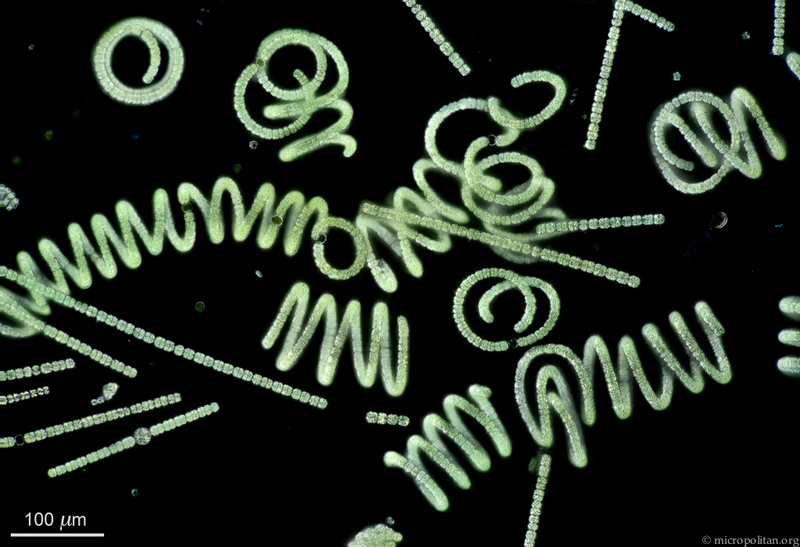 Cyanobacterial bloom of Dolichospermum, photographed in darkfield illumination. Image width: approximately 0,9 mm. The image shows what Frans and I suggest to be the most likely candidate. It's a filament-forming cyanobacterium. They are made out of little balls, the individual cells, that form very regularly coiled strands. I found these myself in late summer in a large lake as a whitish green layer against the surface. During August there was a bloom of these cyanobacteria. So the time and location also fits the description. I have collected them the same way Van Leeuwenhoek did. They float under the surface as a cloudy layer and when you put a bottle in the water you can easily fill it. 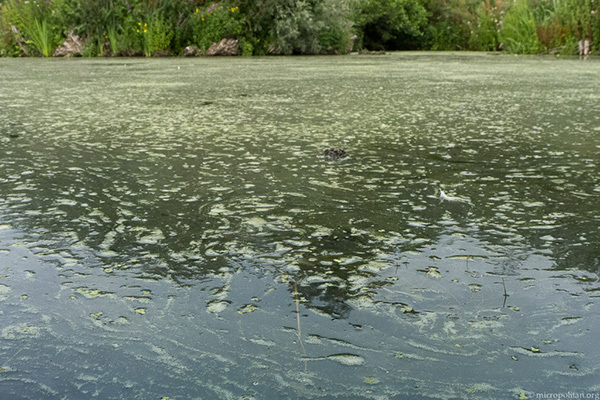 Cyanobacteria, or blue green algae, are bacteria that perform photosynthesis. Although they have a bad reputation they are important oxygen producers. The cyanobacterium that we think Van Leeuwenhoek described is in the genus Dolichospermum. Recently the planktic forms of Anabaena were separated from this genus and transferred to the genus Dolichospermum. The coils of this species of Dolichospermum have a diameter that range between 70 and 90 microns. Van Leeuwenhoek is talking about the whole circumference (not the little cells) measuring about the same as the thickness of a hair from our head. According to the DNBL Collected Letters website the size of such a hair is between 60 and 80 microns. Cyanobacteria bloom, photographed in August in the Kralingse plas near Rotterdam, a peat lake, like the former Berkelse Meer. Dobell ruled out the helical cyanobacteria Arthrospira and Spirulina and I think he was right. Their filaments are more slender but more importantly, they are not made out of little balls. Frans and I can't think of any other suitable candidate. If we compare all the arguments in favor of Dolichospermum and all the arguments against Spirogyra there is only one conclusion. It is much more likely that Van Leeuwenhoek observed cyanobacteria like Dolichospermum. And that would mean it is not only the first account of living aquatic microorganisms, but also the first observation of bacteria, two years before Van Leeuwenhoek described them in his studies of 'pepper water' in the letter dated October 9th 1676. I think it is important to state that we can only speculate here. We can't be 100% sure. But in the case of the greenish helix of little balls we can safely replace Spirogyra by Dolichospermum, the cyanobacterium formerly known as Anabaena, as the number one candidate of the first described aquatic microorganism. What about the 'earthy particles'? If we assume that the whitish water with the green clouds is a cyanobacterial bloom, then the earthy particles could represent cyanobacteria as well. 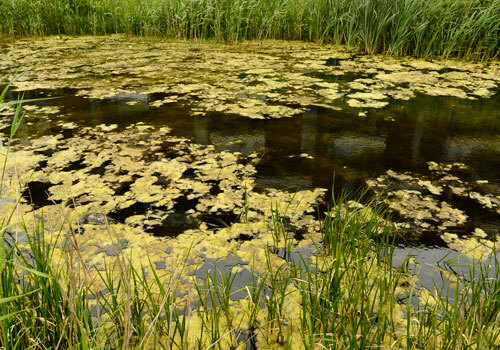 Such a bloom often consists of several genera of cyanobacteria. The earthy particles could be Microcystis. 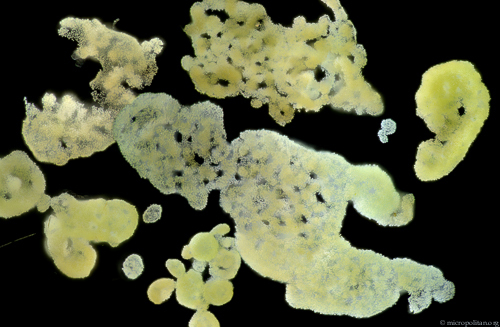 Their colonies have shapes that can be described as earthy particles. And then that would be the first aquatic microorganism ever described. But I think here a Nullius in verba would do. There are many different species of Dolichospermum with various dimensions that form coiled filaments so it could well be that Van Leeuwenhoek saw a different species. But there are not that many species with a regular coil of the diameter Van Leeuwenhoek mentions. If we follow the description of a regular coil with the diameter between 60 and 80 micron we can narrow it down to D. circinale, D. spiroides or D. crassum. The one I photographed may be D. crassum but not without doubt because these species vary in appearance and are hard to distinguish from one another. A paper by Jirí Komárek and Eliška Zapomelová published in Fottea (Journal of the Czech Phycological Society), 2007, vol. 7, issue 1, 1-31, presents a detailed and richly illustrated review of these coiled cyanobacteria. Planktic morphospecies of the cyanobacterial genus Anabaena = subg. Dolichospermum – 1. part: coiled types. This article was written in collaboration. I would like to thank Frans Kouwets for allowing me to publish this investigation that started with his initial idea and for the feedback during the writing of this article. Micscape’s editor David Walker was a great help and offered valuable suggestions. Read his article 'Reflections on studying Spirogyra' which includes images of a Spirogyra species taken using a commercial replica of a Van Leeuwenhoek microscope. I also would like to thank Richard Howey and Maria van Herk for their feedback and help. Thank you to the Digitale Bibliotheek voor de Nederlandse Letteren (DBNL) website for both hosting and making freely accessible the first fifteen volumes of the 'Collected Letters of Antoni van Leeuwenhoek'. All material (except the maps, tendril, copper tin image and images as described below) © Wim van Egmond. 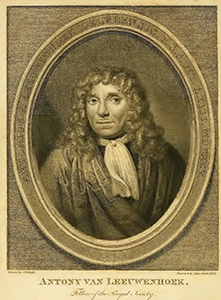 The portrait by Johannes Verkolje of Antony van Leeuwenhoek F.R.S. from the frontispiece of Hoole's 'The Select Works of Antony van Leeuwenhoek', published in two vols. ca. 1800. Now in the public domain at www.archive.org. Van Leeuwenhoek diagram from Plate XXXI of Clifford Dobell's 'Antony van Leeuwenhoek and his "Little Animals"' in the public domain at www.archive.org. The Berkelse Meres Map is an enhanced detail from: 't Hooge heemraedschap van Delflant / Nicolaes en Jacob Kruikius (1712). Source: Hoogheemraadschap van Delfland te Delft inv.nr. OAS 726 from the Delft University of Technology website with thanks. 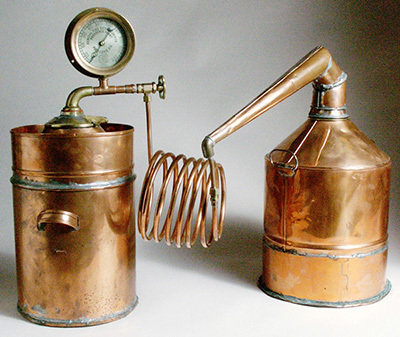 The distiller's copper worm image is web sourced but exact credit uncertain, but will be pleased to add due credit if contacted. First published February 13th 2016. Various minor revisions up to and including February 16th 2016. Published in February 2016 Micscape Magazine. © Onview.net Ltd, Microscopy-UK, and all contributors1995 onwards. All rights reserved. Main site is at www.microscopy-uk.org.uk with full mirror at www.microscopy-uk.net .